Now more than ever, maximizing your marketing efforts requires careful consideration of people’s rapidly changing consumption habits. With tastes becoming more adventurous and options galore, marketers are thirsty for answers on where to place their bets. The beverage category is evolving so quickly that it’s a challenge to pinpoint which trends matter most. Our Beverage Trends Report alleviates the guesswork. 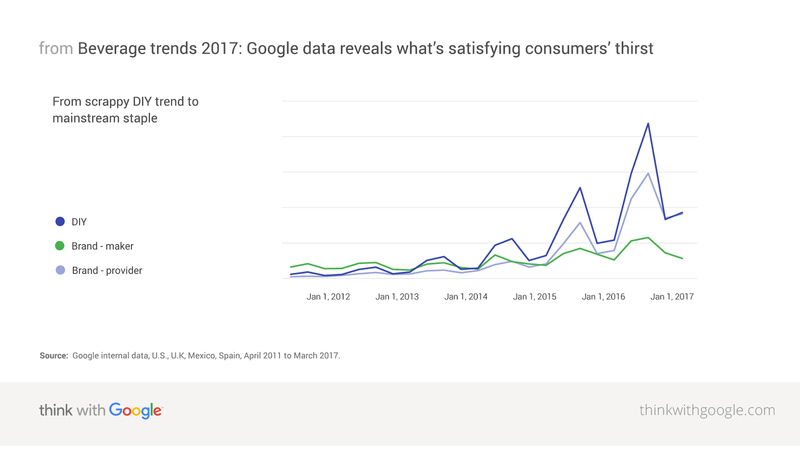 Using Google Search data to help marketers identify and quantify changes in the beverage industry, our deep dive highlights the trends that are taking off in four key markets: the U.S., U.K., Spain, and Mexico. Here, we highlight a few of the trends worth watching. Whether driven by health, taste, or connoisseurship, beverages described by the process in which they are made have shown a big spike in interest. The cold brew process, which involves brewing a beverage using room-temperature or cold water, is said to enhance the flavor of coffee by making it less bitter, less acidic, and more chocolatey and sweet. Our research found that people also like its DIY factor, with many turning to YouTube for content on how to master the process themselves. While cold brew is most prominent in the U.S., the trend is starting to gain traction in other markets such as Spain, and more recently, Mexico. Cold brew is growing across all four markets and is most prominent in the U.S. 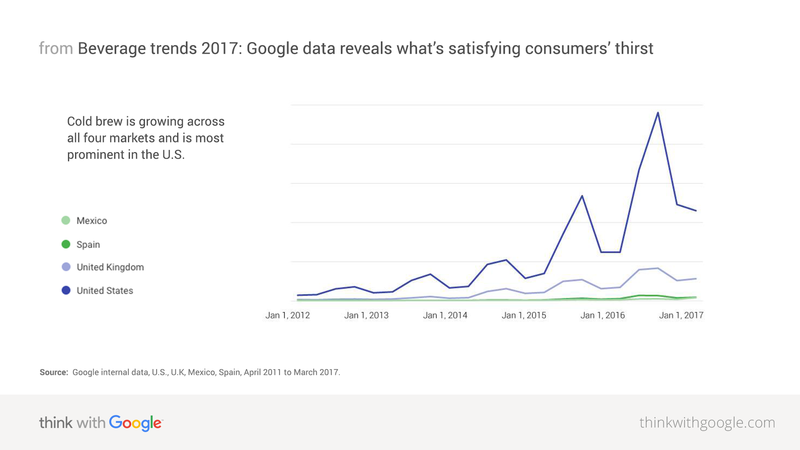 Source: Google internal data, U.S., U.K, Mexico, Spain, April 2011 to March 2017. Thanks to the uptick in functional foods and the strong association with health benefits, people are acquiring new tastes. What’s more, among the top trending searches in the beverage category, flavors associated with plants and herbs are seeing strong growth. One of those flavors, matcha, is gaining traction across all four markets. Although associated with health benefits such as weight loss and antioxidants, matcha is indulgent, often described as creamy and rich. Consumed primarily as a full-bodied green tea, it can also be used as a flavor ingredient in a range of other beverages such as lattes. Up next in the earthy flavor family? Keep an eye on dandelion, turmeric, chamomile, and parsley. From fancy bottles to souped-up sparkling drinks, brands are winning with people who want water to be more accessible, convenient, and enjoyable to consume. Many of the top trending searches are related to enhancing water by boosting alkalinity, adding carbonation, or using premium water bottles. People are showing more interest in sparkling water, in particular. While this carbonated beverage has seen growth in the U.K. and U.S. since 2012, Spain and Mexico have only recently jumped on board. 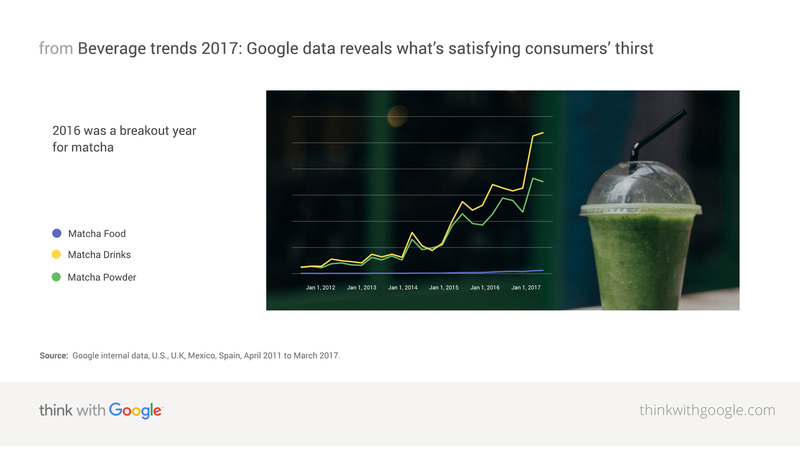 To find out more about which trends are here to stay—and which are destined to fizzle—read the full Google Beverage Trends Report. Find out what the latest beverage trends mean for your brand.